Own the most anticipated and watched sporting event of the year. Complete with highlights from the regular season, playoffs and the big game itself. The 2005 release will contain over 3 full hours of Super Bowl coverage and behind the scenes action. With their victory in Super Bowl XXXIX, the New England Patriots firmly ensconced themselves among the roster of NFL greats. They cranked out three Super Bowl wins in four years, a task rarely equaled. Some naysayers may focus on the fact that the Pats won each game by only three points, but that seems irrelevant. The NFL doesn’t award points for style or margin of victory - all that matters is that check in the win column. It’ll be fun to see if the Pats can continue this tear. They’re still a young team, so it’s altogether entirely possible they’re not done. Even if they never reach the heights again, though, they definitely go down as one of the NFL’s great teams. 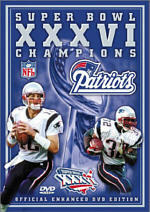 For this DVD called Super Bowl XXXIX Champions, we get a look back at their 2004-05 season. Actually, the main program doesn’t concentrate all that heavily on the big game itself. The program quickly rushes through training camp and then provides a general overview of the regular season, from game one through the playoffs. It takes a little more than half of the show to complete the regular season; we enter the playoffs after about 40 minutes, and each of those three games receives fairly full coverage. Of course, the Super Bowl gets the most attention, but the other two contests go under the microscope as well. The playoff material seems most interesting. The program runs through the regular season so rapidly that we don’t hear much more than very basic notes. A few games get deeper focus, though. For instance, the season-opening contest against the Indianapolis Colts receives more time than most since it presents a rematch of the 2004 AFC Championship Game. We also hear about the Pat’s record 21-game winning streak and its demise against the Pittsburgh Steelers. Otherwise, we get the basic highlights but little else. The presentation becomes more broadly delineated with the three playoff games. These gave us reasonably full details of the contests. The two pre-Super Bowl games filled a total of about 12 minutes, and the championship itself occupied the program’s final 14 minutes. Produced by NFL Films, Champions definitely isn’t the place to go for much more than a puffy, feel-good look at the Patriots’ season. I don’t expect this sort of program to be a down-and-dirty examination of events, and I must admit it’s tough to find adversity in yet another remarkable year for the Pats. While past programs of this sort offered occasional soundbites from players and coaches, that doesn’t happen here. We get one quick statement from player Rodney Harrison and that’s it. Other comments do appear, but in different circumstances. We hear a little from coach Bill Belichick and quarterback Tom Brady during press conferences, and we also see occasional impromptu remarks from the locker room and the sidelines. The casual statements are mildly interesting but not overly revealing, though it was somewhat daring to hear Harrison accuse the NFL of adopting new rules just to put the Pats at a disadvantage. 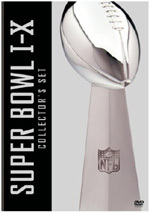 As with past entries in this series, Super Bowl XXXIX Champions seems aimed mainly at an audience of Patriots lovers. General NFL fans may enjoy the scrapbook look at that team’s season, but I can’t imagine many folks who aren’t Pats diehards will want to revisit the piece. It’s a puffy and fluffy look at their season, and its lack of depth makes it less than scintillating. Super Bowl XXXIX Champions appears in an aspect ratio of 1.33:1 on this single-sided, double-layered DVD; due to those dimensions, the image has not been enhanced for 16X9 televisions. The picture will look familiar to fans who saw the prior discs in this series, as it offered very similar visuals. As with past releases, the Dolby Surround 2.0 soundtrack of Super Bowl XXXIX Champions mainly suffered from a lack of ambition. The soundfield appeared very restricted for the most part. Frankly, the majority of the audio seemed monaural. Music opened up the spectrum fairly well, as the side speakers displayed the score with good stereo imaging. In addition, some crowd elements during games broadened the environment to a minor but useful degree. Surround usage appeared totally limited to general reinforcement of music and cheering; the rear speakers played a very small role in the presentation. As we move to the supplements, we start with a big attraction for me: Paul McCartney’s halftime performance. In this 12-minute and 55-second clip, the former Beatle tears through “Drive My Car”, “Get Back”, “Live and Let Die”, and “Hey Jude”. Macca’s done most of these songs to death over the years; only “Car” is an infrequent part of his concerts. However, he manages to make them sound damned fresh here. I’ve seen McCartney live many times and didn’t expect much from his halftime appearance, but I was quite impressed. Some question remains about whether Macca lip-synched part of the show, but it doesn’t really matter. He turns in a strong showing in this solid little set. For a very cool addition, we head to the World Broadcast. The 74-minute and 15-second show offers the game in its entirety. Minus commercials and most delays, we just get the action with English play-by-play. It feels weird to see a football game fly by at such a pace, but it’s a lot of fun nonetheless. I never quite realized how much tension the many pauses add to the game, though; this presentation is satisfying for a recap, but it doesn’t leave room for the kind of interpretation and analysis we’d like to perform during a live broadcast. Nonetheless, I really like this extra and think it contributes a lot of value to this DVD. More of this sort of material shows up in Post-Game Sounds. The eight-minute and 45-second collection gathers after-Bowl remarks from Belichick, Kraft, and Patriots Brady, Harrison, Dillon, Bruschi, McGinest, Seymour, Vinatieri, game MVP Deion Branch, Matt Light, and Mike Vrabel. It’s more of the same, with additional generic comments from the participants. Don’t expect much interesting material here. If you’re a fan of the New England Patriots, you’ll get a kick from Super Bowl XXXIX Champions. It gives us a nice souvenir of the season that ensured their enshrinement as one of the NFL’s all-time great teams. For those who don’t live and die with the Pats, however, the show seems too light and fluffy to provide much value. The DVD provides bland but acceptable picture and sound along with an erratic set of extras highlighted by the inclusion of the complete Super Bowl as well as a good performance from Paul McCartney. Diehard backers of the Patriots - or big McCartney fans like me - will want to give it a look, but others probably won’t find much in it to interest them.